BLAIRSVILLE, Ga. – Annexation of the Conley property on Pat Haralson Memorial Drive was discussed during the Blairsville City Council meeting Tuesday, March 6. According to Mayor Jim Conley, a developer interested in the property has requested city annexation of the property before proceeding with a development project. From the city limits to the Conley property, a portion of Butternut Creek Golf Course, which is owned by the county, and a stretch of a 1.47-acre property owned by Daniel Davenport falls in line with the proposed annexation route. While the county has agreed to an easement of the golf course property, Davenport, who was present at the meeting, requested of the city to bring water and sewer utilities through his property before allowing annexation of his property. After further discussion, Councilman Tony Dyer made a motion to withdraw the annexation proposal followed by a second from Councilwoman Betty Easter. The motion failed 3 to 2, with nay votes coming from Councilmembers Rhonda Mahan, Robert Moore and Mary Ruth Cook. On Friday, Mayor Conley stated Davenport had discussed the situation in the days following the meeting with the owners of Conley property and a possible agreement was in the works, which would clear the way for the annexation. 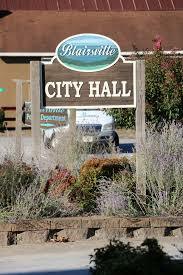 The council approved two equipment purchases for the Blairsville Police Department. Sergeant Shawn Dyer informed the council of a recent audit of the department conducted by the Georgia Bureau of Investigation (GBI) in which the GBI recommended the use of departmental phones for city officers as well as the addition of wi-fi hotspot devices within city patrol vehicles. Dyer explained the phones would be used by full-time officers for official police business. Currently, officers use their personal cell phones for police business while on duty, and GBI, in the audit, claimed this presents a security risk and the possibility of a personal information breach for the officers. Concerning the addition of the hotspot devices, Dyer stated the technology upgrade will ensure a safer and more effective environment for officers while conducting routine traffic stops. The hotspot devices will provide instant Internet access to the Georgia Crime Information Center (GCIC) database and allow officers to access information of the vehicle and the recorded owner before initially approaching the vehicle. According to Dyer, six cell phones (iPhones) and eight hotspot devices will come from Verizon at a monthly cost of $564.57. Dyer also told of the need for a large metal cabinet that can be locked to store evidence or guns in the squad room at the police department. The sergeant stated a large lockable cabinet in the squad room would allow all shifts the ability to store evidence if the evidence room of the department cannot be accessed. Dyer said he found a cabinet suitable for such a purpose for around $2,000. Both expenditures were approved unanimously. The council gave approval to proceed with RevoPay as an online electronic payment method for payments of all fees, permits and/or taxes to the city. Last month, the council discussed and approved an option for accepting credit or debit cards for water services payments. Kaye McCann, city clerk, explained to the council the RevoPay system would allow customers to pay all bills to the city in a lump sum by credit or debit card or by electronic check either online or over the phone. Also, city hall would have access to RevoPay, so that any customers making payments in person would also be able to make payments via those options as well. According to McCann, there is no charge or fee to the city to use this service; however, a percentage-based fee from RevoPay would be passed along to customers using the service. When asked about the percentage of the fee, McCann explained the fee would likely fall between 3 to 5 percent and that the percentage would be determined over time by the amount of customers using the service. McCann further explained customers using RevoPay would know before the transaction is complete exactly how much the fee is. Jody Cook, wastewater supervisor, delivered an update of a wastewater issue involving the Aviagen Hatchery, a poultry hatchery facility located near Colwell Detention Center. Last month, Cook reported increases in the chemical oxygen demand (COD) at the treatment plant were discovered in January. At that meeting, he said it was determined pollutants stemming from outdoor wash downs of the hatchery’s delivery crates were the cause of the increase of COD. Cook also stated last month the issue does not pose a health risk to anyone, but rather puts a greater strain on the wasterwater treatment facility. This month, Cook told the council the hatchery had changed its clean-up policies. “It has made a difference, but I think we’re going to have to do a little bit more there because our readings are still high,” Cook said. Cook stated officials from Aviagen have been cooperating with the city in an effort to correct the issue and told Cook to inform the hatchery if the changes in their cleaning processes did not resolve the issue. To this, Cook told the board he wanted to do a few more tests before going back to Aviagen since recent rains have disallowed the possibility of accurate testing. In other business, the council approved a change in the type of envelopes used to mail water bills to customers. The new envelopes will feature a clear window panel on the front of the envelope and, as Mayor Conley pointed out, are easier for mail sorting machines to process. The council entered into a 12-month contract with Jeff Burks, of Total Geek Tek, for regular IT maintenance and upgrades for all city departments. Burks’ hourly rate will be $40 an hour, and he will service city computer systems two days a week for a total of 16 hours a month, according to the parameters of the contract. Councilman Tony Dyer stressed the need to move forward with a paved public parking lot, public restroom facility and a greenspace on city property located behind city hall. Dyer stated he would like to see the space, when completed, dedicated to longtime state representative and Blairsville native Carlton Colwell. Dyer also mentioned the idea of honoring Union County Sheriff Mack Mason at the next city council for the sheriff’s office ongoing cooperation with the city police department.